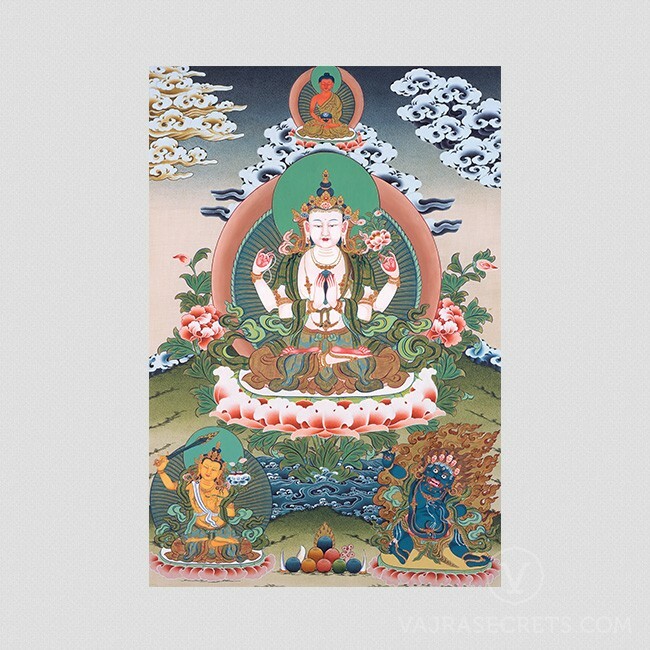 A canvas printed thangka of Chenrezig, the Buddha of Compassion, who is also known as Kuan Yin in Chinese, Avalokiteshvara in Sanskrit and Kwannon in Japanese. A canvas printed thangka of Chenrezig, the Buddha of Compassion. Chenrezig has a gentle and serene disposition on his face. Also known as Kuan Yin in Chinese, Avalokiteshvara in Sanskrit and Kwannon in Japanese, Chenrezig manifests in many different forms to represent different facets of the same energy. Here he is depicted in the traditional four-armed form. The four arms represent the four immeasurables of loving kindness, joy, equanimity and compassion. Two hands are folded in prayer, holding a wish-fulfillling jewel at his heart. In this same way, he holds Bodhicitta, or altruistic love for all sentient beings closes to his heart. He inspires us to practise real inner transformation of our negative qualities becoming truly beautiful from the inside out. On his right is Manjushri, Buddha of Wisdom and on his left is Vajrapani, Buddha of Skilful Means. Taken together, the presence of Chenrezig, Manjushri and Vajrapani can be said to represent Lama Tsongkhapa, the great 14th century Tibetan scholar and saint who is an emanation of these three great Buddhas.